When we create information we also create patterns within the information, whether consciously or unconsciously. We might decide to organize information accoring to some principle. Or, we might not be conscious of a preconceived notion we have that skews the information toward a particular point of view. When patterns interact with other patterns or with the information itself, they create information moiré. This moiré can either add to or subtract from the effectiveness of the information. The French form, moiré, often refers to undesired patterns that are created when multiple patterns interact with each other. The moiré effect is the reason that professionals appearing on television avoid wearing certain patterns. When small, regular patterns interact with the the resolution of the television screen, the clothing appears to strobe. In print, the angles and frequencies of the printed dots used to make up an image are chosen carefully to avoid introducing a noticeable moiré pattern. Moiré effects can also be used to advantage. For example, RIT’s Screen Pattern Analyzer overlays a line pattern over a print sample to create moiré patterns. The location of the center of the moiré pattern on the tool indicates the frequency and angle of the halftone dots that make up the image. Sometimes, these patterns are introduced with purpose into a finished work. For example, moire (without the accented é) is a kind of fabric generally finished by running the fabric through ribbed rollers. 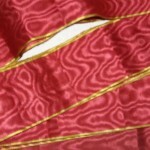 The ribbed pattern of the rollers creates an interaction with the ribs of the fabric. informoire is a place to discuss the patterns and interactions we discover. I hope you’ll join the conversation.